It hit me last week that I’ve still got four Shetland half-fleeces to wash this summer while I can dry them in the hot sun. No problem, right? After all, it’s only August. Plenty of summer left. 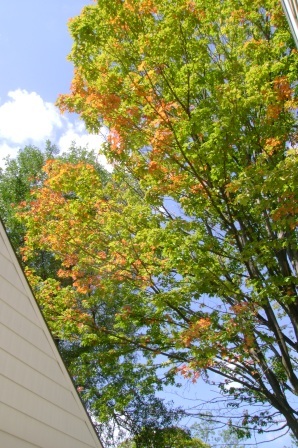 This is the maple tree in my backyard…two weeks ago. As of today the leaves are falling. Yikes. So, I’m on the wool washing. 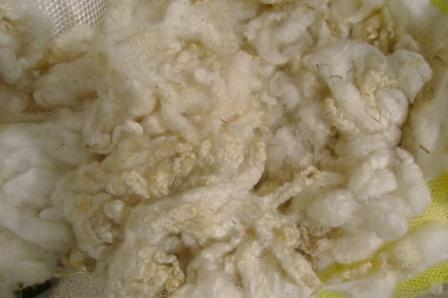 Yesterday a manky fleece from Clair went in to soak. This time I got smart and turned up the water heater. The whole time I kept singing, “Clair / If ever a moment so rare / was captured for all to compare / that moment is you / and all that you do…” Don’t worry. I had to look it up too. Gilbert O’Sullivan, 1972. Here’s the YouTube video. Clair came out looking like a million bucks. Well, maybe a million bucks that had taken a roll, roll, roll in ze hay. There’s still a lot of vegetable matter to be dealt with. But take a look at the lovely locks. Who’d have known there was white wool under all that grease and dirt? For now, I have separated this junk with plans to wash it again. But, short of manually scrubbing it out, I’m not sure another soak will get it clean. Ideas? And if there are any shepherds reading, why does the softest fleece always seem to have the most VM to pick out? Or is that one of those perception things, like how the sweetest apples are at the top of the tree, or the biggest berries grow on the thorniest branches? Entry filed under: Sheep to Yarn Process. 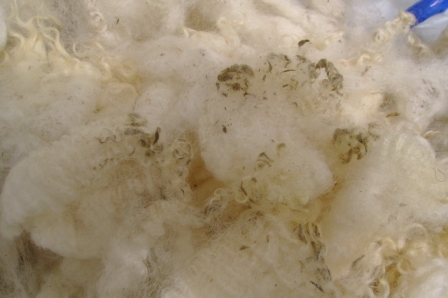 Tags: cleaning fleece, raw fleece, Shetland, vegetable matter, VM. OK, I had one, a Lincoln, lamb’s wool, and it had funky tips like you have in your picture up there. What I eventually had to do was take them out on the porch, and comb the funk out of the tips, and then, only then, could I wash the tips and have them bear a resemblance to clean fleece. I don’t even want to think about how much I need to wash. I was blessed with some Llama and Alpaca fleeces. Wildly fine, and lovely stuff, dustier than under a bed at a boarding house, and I’m sure those animals denuded the forest and tucked all the leaves and vagrant seed pods in their fleece for safekeeping. There they are, a potential ecological disaster, or would be if they were not local fleeces. As it is, I can see how the forest might migrate to town with these fleeces. And here I am, working (or goofing off at work at the moment.) Shhh. Speaking of seed pods, I put some unusable wool around my herbs this summer for mulch and what do you know–a stock of shattercane seems to have sprouted up in my parsley pot. How did you get into making wool? where do you get all this fleece from (other than the sheep, obviously :P ), do you have to buy it from a farmer? do you need lots of special equipment? are there any good books about it that you recommend to learn more? sorry for all the questions, i’m a city knitter, i just walk into a shop and buy my yarn. Sheep and fleece are way out of my natural element but looks like it would be a great skill to learn! Hey Heatherly! I’m a city knitter too. My neighbors must wonder what the heck I’m doing this week with the big net bags of fluffy stuff out on my picnic table. Luckily I have a source who feeds my wool addiction. My sister–who lives a rural life–has been buying fleeces from farmers (er, shepherds?) for several years and shares them with me. I think she found Clair and the other 6 I now have through a Craigs List ad. This summer she gets her own flock. Equipment? Just a lot of Dawn dish soap and hot water for washing. Also, a strong stomach for “farm smell” helps. :-) I pick the hay and weed bits out by hand, then use hand cards to fluff it up for spinning. Then, of course, there’s a spinning wheel or a drop spindle. I got my wheel (“My Preciousssss”) a year ago. A wheel averages $500, but there are models out there for $200. Here’s a great site: http://www.joyofhandspinning.com. Also, there are videos on YouTube of people washing wool, carding wool, spinning, etc. Watch out, Heatherly. Like knitting and crocheting, if you like fiber, it’s totally addictive.